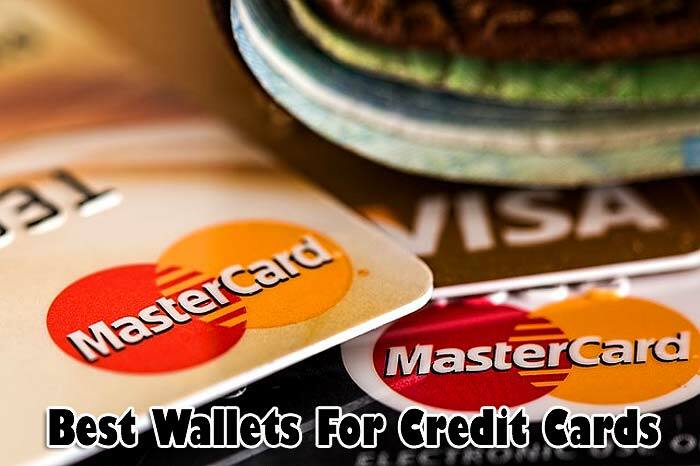 Best Wallets for Credit Cards: A big, fat wallet isn’t always fun, that is why we have assembled the best wallets for men and women that are trendy and practical. These multiple credit card wallets have been tried and tested with many positive reviews around them. The best part is you don’t have to shell out big cash to own one. Whether you are seeking to keep all your credit and debit cards and IDs in order or looking for that extra protection of the best RFID blocking wallet, this guide will help you make an informed buying decision. They make the NapaWalli wallet of full grain carbon fiber leather, and it comes in a range of styles and colors. This men’s wallet can hold up to 3 cards and will fit nicely into the front pockets. It also has 2 larger slots including one for your ID. It claims to use 4 rare earth magnets instead of two that helps to keep your items secure. This credit card wallet uses RFID technology that guarantees reliability and safety of your cards. The detailed stitching on this product makes the card holding slots very strong. This men’s wallet with money clip is a good leather wallet for those who carry wads of cash around. The NapaWalli wallet is a great wallet that is affordable and comes in small, beautiful packaging. The Elan wallet has a discreet design, and it can come in handy whenever you want to carry a couple of cards and some money for your holiday or short travel. They equip this wallet with a special lining that protects your credit, debit, access, and ID cards from unwarranted scanning. This wallet is made from high-quality Napa leather that is durable and scratch resistant. 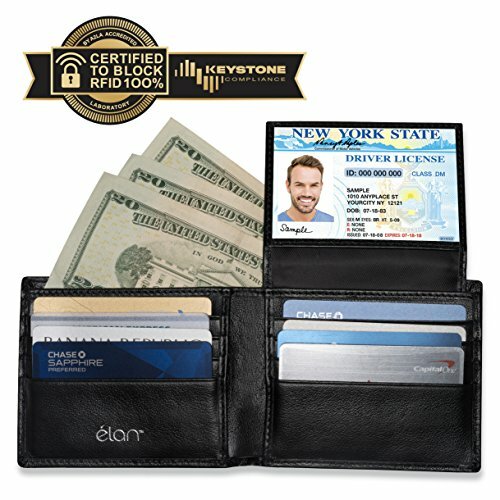 Elan wallets have 2 bill pockets, 8 credit card pockets, and a Flipout ID window, making organization easy. 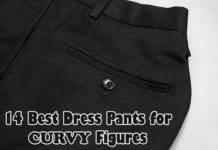 They have a minimalist design that is easy to slip in and out of the pocket. If you don’t like to carry your wallet in your back pocket, the Travelambo wallet is a great choice. This nice wallet for men is simple and chic, and it comes with an embroidered lining that blocks RFID signal for your credit and debit cards safety. The Travelambo wallet is made from 100% cowhide leather that is durable and long-lasting. This wallet has 6 slots where you can keep your debit/credit cards, access cards, driver’s license, and ID badge. It is available in a collection of 34 colors to suit your preference and style. The Leopardd wallet has a classic two-fold design, and it uses the finest NAPA full grain cowhide to give you a very smooth surface comfortable to touch. This men’s wallet has 10 card slots enough to fit up to 18 credit or debit cards. It also has 2 currency windows that can hold all your cash and 2 ID windows for your ID card and driver’s license. 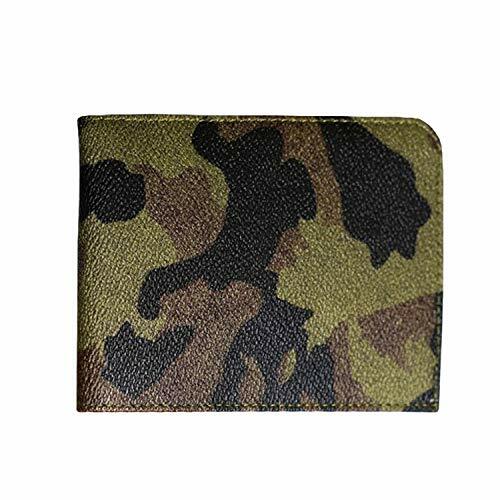 The Leopardd wallet has a military grade RFID blocking security that protects you from electronic pickpocketing criminals. This wallet isn’t the slimmest of options, but its generous space makes it an undeniably attractive choice. The Leopardd credit card holder wallet comes as a thoughtful gift for groomsmen or husband. You will love its vintage vibe that can never go out of style. If you are looking for a compact option, this is one of the best men’s wallets. This slim wallet for men is discreet, small, and stylish and it can fit perfectly into your front pocket. There are 4 slots you can keep your credit cards, 2 slip pocket pockets to keep your business card, a transparent window with a finger glide for your work badge or ID and middle slots to keep your cash, tickets, coupons, and so on. 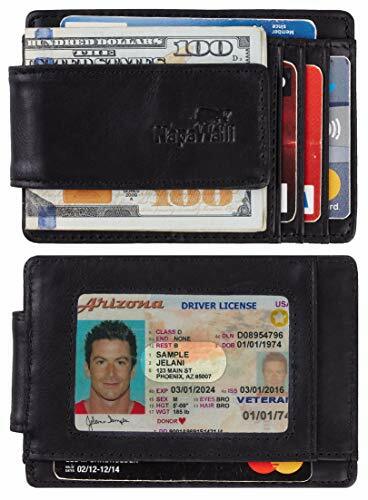 This mens front pocket wallet also features an exclusive RFID blocking technology that helps to protect your identity while traveling or shopping. There is no question about the durability of the ESTALON wallet as it is made of 100% genuine leather. 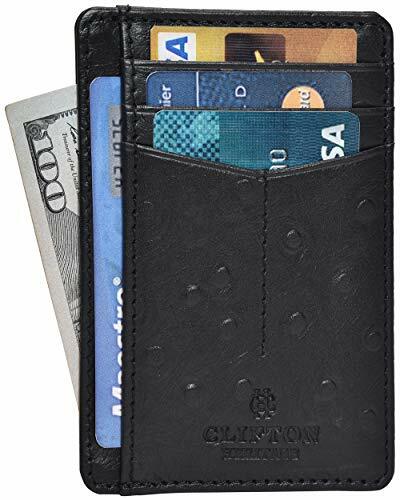 This leather wallet for men is highly affordable; in fact, it is one of the most competitively priced men’s purses on the market. Zhoma travel wallet is a high-quality genuine leather with solid hardware and fabric lining. This leather man purse has a tin foil layer between the materials of the wallet that block hacking from scammers. 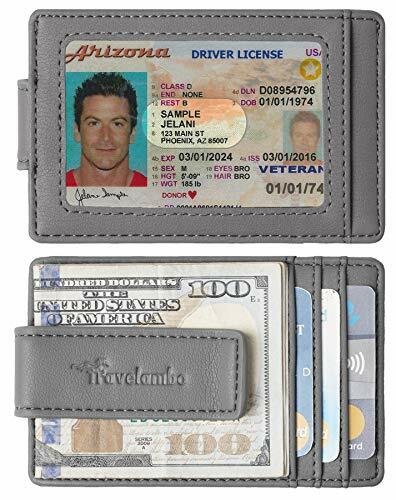 This mens travel wallet features an ID window and 11 accordion folds that can comfortably hold up to lot of credit or debit cards (18 to be precise) as well as cash and coins. The Zhoma travel billfold wallet has a secure and robust zipper that glides easily and smoothly which allows for easy access to cards and folded bills. This mens zipper wallet is a lightweight and affordable men’s wallet. The Clifton Heritage minimalist wallet is made of superior cowhide leather that is masterfully sewed with polyester and durable fabric to ensure it lasts longer. The leather surface of this wallet has disorderly scratches, scars, and wrinkles that present you with a style of wildness and retro. 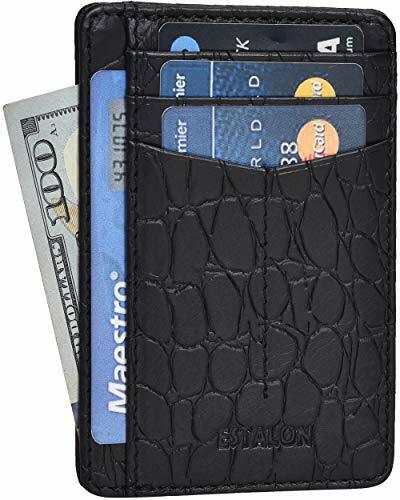 This top wallet for men also features RFID technology that helps to protect your cards, so you need not worry about your card information being stolen. This best minimalist wallet has 3 card slots, one change pocket, and one ID window display. The Napal Swiss wallet has a straightforward and elegant design, and it comes in 9 different colors. What makes this wallet unique is that it is handmade by experienced Swiss artisans. It is made of high-quality calf leather that creates extreme comfort when sitting or walking. This genuine leather wallet has an ultra-thin and refined design, and it can fit any pocket for daily use. This thin wallet features RFID protection which helps to stop remote scanning of your cards. The cards are easy to view and access thanks to its transparent inserts display. This best RFID wallet can hold up to 24 cards, and it lays them out like a photo album. 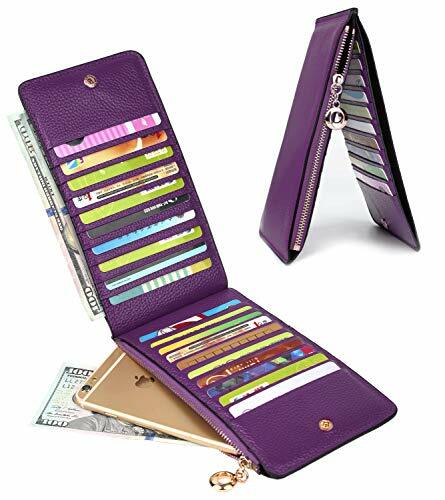 This is a high capacity women’s wallet available in 12 different colors. Not only will this clutch keep you looking stylish, but it will also help to stay organized. This cool wallet is designed with style and organization in mind, and it is loaded with options that will assist ladies in their everyday life. 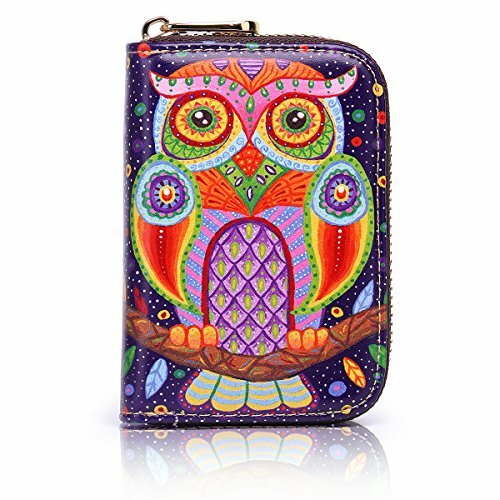 This wallet is elegant and suitable for many occasions like a vacation, traveling, dating, party, shopping, and many more. The RFID technology in this wallet will help protect your credit cards, personal data, e-passports, and ID cards from electronic pickpocketing criminals. This women’s wallet is delicately designed and neatly stitched to ensure it lasts longer. 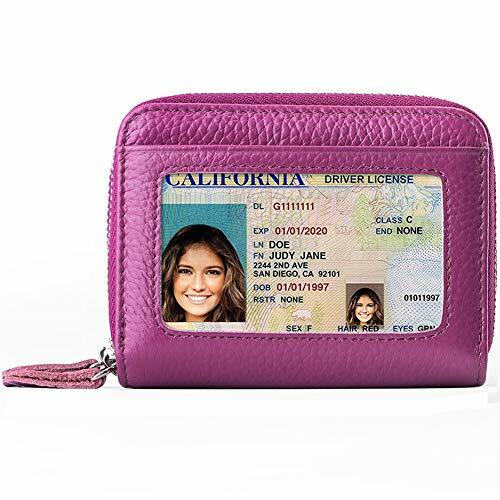 It can hold up to 19 credit cards, 3 passports, and an ID card. It comes with a removable checkbook cover you can use as a checkbook wallet. There is also an exterior zippered pocket with 2 additional pockets where you can keep your cash or cellphone. This is another women’s wallet with huge storage capacity. 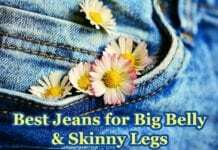 It comes in 8 different colors so you can find the one that suits your needs and lifestyle best. 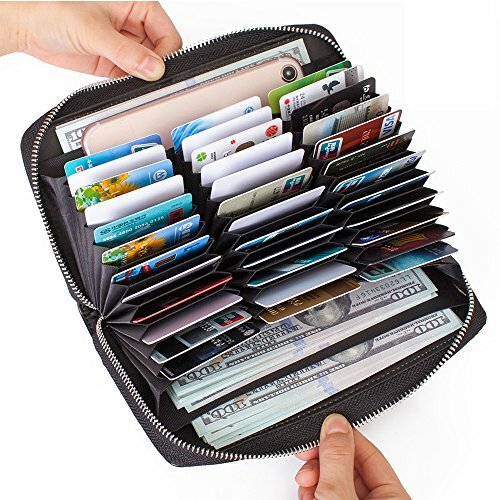 It has 2 cash compartment and 36 card slots where you can store your cards, cash, or phone. It comes with a zipper around design that helps to protect your private information, and it makes your wallet look simpler and fashionable. This RFID wallet is perfect for locations such as an office, campsites, and other social occasions. The RFID technology also helps to protect your credit card, passport, license, and many more. The Buvelife wallet is made of soft cowhide that comes with pebble texture on the surface, and it is comfortable to touch. This wallet is simple, stylish, and lightweight, making it convenient to carry around. YALUXE wallet is made from 100% leather that is soft and comfortable. It is made of detailed streamlined stitching, so you don’t have to worry about it tearing apart. This women’s credit card wallet is scratch-resistant, anti-sun, anti-pressure, and anti-moisture. The RFID technology of this wallet will help to protect your privacy from scammers. 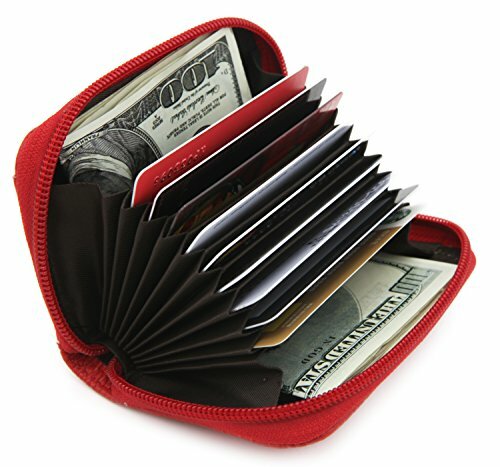 It has a clear layout that helps to keep all your money and cards organized. The YALUXE wallet does not feel bulky even when you load it up. With a zippered compartment, an open pocket, and 20 card slots, this wallet has enough room to hold all your essentials. This is another high-quality women’s wallet that is made of 100% cowhide. It has a 3D dimensional pattern that can give you a beautiful experience. 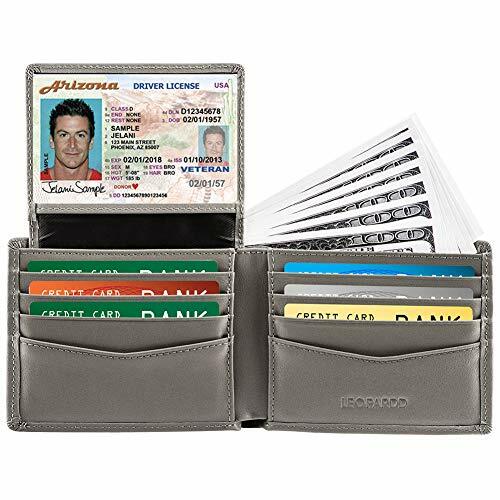 The APHISON wallet has 1 zippered compartment, 10 credit card slots, and 2 cash slot that can hold plenty of cash. They equip this wallet with advanced RFID technology that helps to protect your information. The Leopardd women’s wallet is made with full grain milled cowhide that is durable, soft, and smooth. 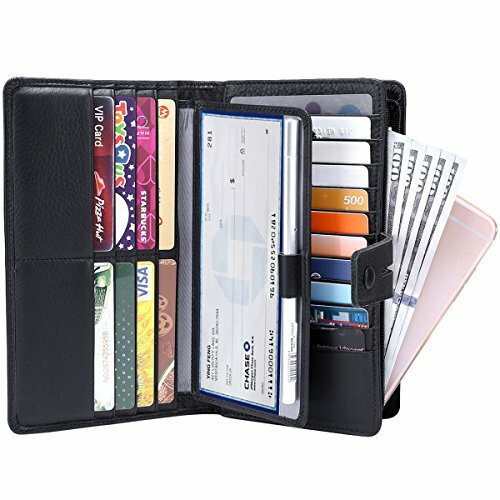 This is a functional wallet with 1 ID window, 1-coin pocket, 10 credit cards slots, and 2 money pockets that will help you to stay organized. It comes with a high-quality zipper that won’t fall off. It comes in 13 different colors to suit your needs and preferences. They equip the Leopardd wallet with anti-theft technology that helps to block RFID signals from cards. This compact wallet is convenient, and safe to carry, making it an excellent accessory for your travel, business, as well as daily life situation. If your current wallet isn’t up to the task of carrying all your cards and protecting them from electronic pickpocketing criminals, perhaps, it is time to give one of these wallets for credit cards a try.